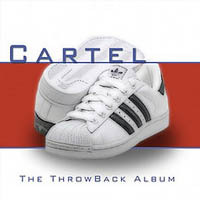 An underground New York hip-hop producer, Cartel, brings his music genre back to its roots in his newest release ‘Tha Throwback’. “I named it that because it’s a throwback to (…) the 90’s where artists actually cared about hard beats and the lyrical content of their music as opposed to a lot of crap that passes for hip hop on the mainstream radio and video shows. It’s a throwback in terms of production and lyrical quality” says Cartel. UPDATE: T.G.’s track “Gotta Fight” produced by Cartel was included on FrostWire FrostClick 2009 Compilation Album Volume 1 celebrating the first 1,000,000 downloads of 2009. This new album is a free download with the option to purchase the enhanced version that includes a cappellas and the “Rock Stars” video performed by Full Fam from the Universal Indie Records Online Store. As of this writing Cartel’s album has received over 29 thousand downloads, currently over 100 people are still downloading (at the same time), and over 850 are still actively seeding it even though another artist is being promoted. From each weekly promo, we learn new things, and we’ll learn more if other artists choose to share their experience as nicely as Universal Indie Records has done it. We’ll be updating our Promo Contact page with new tips thanks to Cartel. I must be doing something right, lol. No sooner did I decide to go the netlabel route and add the Creative Commons disclaimer to my site, I was contacted by the guys at Frostwire. For those of you who are not in the know, Frostwire was created by a few of the programmers responsible for Limewire who didn’t like the way the company was heading. They branched out and created a fork of Limewire and named it Frostwire (those familiar with the open source community know this type of thing happens all of the time). Anyway, it seems they came across my music on Jamendo and approached me about featuring my music in their application for a limited amount of days. The way it works is that once someone fires up the Frostwire application the promotion featuring my album appears and enables the user to download the album with one click. Do you realize the importance of having your music pushed in front of thousands of people? None of that “Come check out my Myspace page� crap. They even interviewed me for their blog. The only thing I regret is not setting up my Twitter page BEFORE the promotion started. I’ll admit that I really didn’t understand the purpose of Twitter but I definitely do now. If you don’t have a page on Twitter and you’re trying to expand your fanbase, set one up immediately. So anyway, my promotion has run its course and after all is said and done 26,769 have downloaded my album. Many have visited my site, joined my mailing list and Twitter page, and have requested me as a friend on Myspace. In the span of a few days, the awareness of my project has expanded exponentially. I have to give the Frostwire guys credit because in a day and age when most people are trying to make money off the backs of indie artists, they offer this service for FREE when they could have easily charged for something like this. All this has taught me that you need to attack your promotional efforts on as many fronts as possible because you never know where an important opportunity will arise. If it wasn’t for Jamendo, Frostwire wouldn’t have found me. Now that on Twitter, MySpace and Jamendo maybe ll finally get around to getting a Facebook page up and running. Thanks to Universal Indie Records for believing in Creative Commons and Filesharing, and thanks to the FrostWire community for sharing. We’ll keep trying to bring you the best content during 2009. Cartel has been in this business for a while. He learned how to produce from Chyskillz (who did the first Onyx album) and Large Professor, he ran with Randy Allen and Jam Master Jay for a short period of time, he produced the first tracks that Cadillac Tah (of Murder Inc) actually rhymed over.